Summary : A very weak tasting vanilla tea that both tastes and smells like supermarket variety French Vanilla teas. Review : If you've read my review of Bigelow's French Vanilla Tea, you certainly know by now that I absolutley love Vanilla. All things vanilla. Vanilla ice crea. Vanilla yogurt. And the list goes on and on. And so, when I ordered a "tea for one" tea pot/kettle from Adagio Teas (which is an awesome tea pot/cup by the way), I couldn't resist ordering their Vanilla Tea Sample in hopes that I could find a vanilla tea that I actually like. And I was fervently hoping that somehow, someway, this tea would cure my vanilla craving and sweet tooth all at the same time - without any calories to boot! 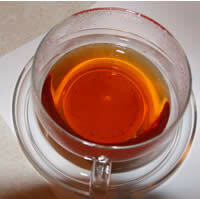 I was especially hopeful after reading the positive reviews about this Vanilla tea on Adagio Teas. In hindsight - which is always so 20-20 clear - I should have read the reviews a bit more closely. If I had, I would have discovered that this tea tastes hardly anything like Vanilla but still tastes ok.
Adagio Tea samplers are very nicely packed in small, metal tins. As such, the tins prevent one tea from contanimating another as well as keep the tea fresh. I'm not quite sure if I like the tins used by Adagio Teas for their samplers or the stay fresh, vacumn sealed bags used by Culinary Teas for their samplers - but regardless, both work equally well. Moreover, the tins from Adagio can be used for other things once the tea is gone. I knew the minute I opened up the Vanilla tea sample from Adagio Teas that I probably was going to be disappointed. Why? Simple, I couldn't smell vanilla! Even the bagged Bigelow French Vanilla tea had a subdued vanilla smell too it (although that was a French Vanilla), but this particular tea had hardly any aroma at all. And perhaps worse, what aroma the tea did have reminded me all too much of the aroma from Bigelow's French Vanilla Tea - a tea I didn't like that much! But, I'm a survivor and an adventurer - so nothing ventured, nothing gained. The instructions for the tea are labelled on the side of the tea container. So, I scooped out the tea, boiled a cup of water, poured the water over the tea and began the 5 minute countdown. The tea has a very nice, clear, tan color to it - something I fully didn't notice on my previous Vanilla Tea reviews since I didn't have a clear mug to fully see the tea! But alas, while the tea was quite pretty to look at - I found it rather disapointing to drink. There was no hint of vanilla at all in the tea. And it was also rather bitter. Truthfully, it tasted remarkably similar to Bigelow's French Vanilla Tea - so if you like that you'll undoubtedly like this. However, if you are like me and LOVE vanilla and are desperately searching the planet for a tea that actually tastes a bit like vanilla ice cream - well - keep searching, as you won't find it in this tea. Rumor has it that this tea can be mixed with other tea to make a nice, sweet tea. In particular, chocolate flavored teas are able to be mixed with it. As I haven't tried this yet, I'll hold my vote on whether it is good or not - but admittedly, I have my doubts. Having tasted two vanilla teas and having not liked either of them (and where they both tasted remarkably similar), has sadly made me jaded in the vanilla tea department. Recommendation : If you like the supermarket varieties of vanilla or french vanilla teas, you'll like this I suspect. But true "vanilla lovers" will not. Brewing Instructions : Place 1 teaspoon of loose leaf tea in an infuser. Boil 1 cup (5.5 ounces) of water. Pour water over the tea and wait 5 minutes. Note, the tea leaves in this tea are very small. Unless you have a finely woven infuser, expect some tea leaves to make their way through the infuser and into the tea.